Marco is an engineer with 18 years of experience of which the last 10 in marine industry. Marco holds two Master degrees in Engineering and his working on his MBA. His background is a mix of mechanical engineering, fluid power hydraulics and software development. 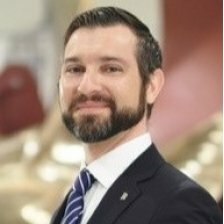 Marco has been working in Rolls-Royce as VP Engineering for Deck Machinery and Motion Control, VP Product Safety for Marine and now as VP for Rolls-Royce Intelligent Asset Management product portfolio.